Looking for that special Christmas light experience this December while travelling? Well then you have come to the right destination. Australian cities and regional towns have been following that other great North American tradition (along with Halloween) of Christmas Light displays for many years. Take some time from your Australian vacation to experience some truly unique local culture and immerse yourself in a Christmas exhibit. From traditional nativity scenes to spectacular light arrays, Australia has it all. And here are some of my favourites. At close by Bondi Beach, travel to 5 Waratah Street to see over 7000 sparkling lights, moving figures, a giant snow man and a unique display of 6 kangaroos pulling a ute. In the inner city suburb of Lilyfield, the entire residents of Lilyfield Road have ammassed an amazing 90000 lights. The street is adorned with Santa and his reindeer along with a giant snow machine. It is worth travelling over the Sydney Harbour Bridge to the idealic suburb of Lane Cove, just a 10 minute drive from the city. 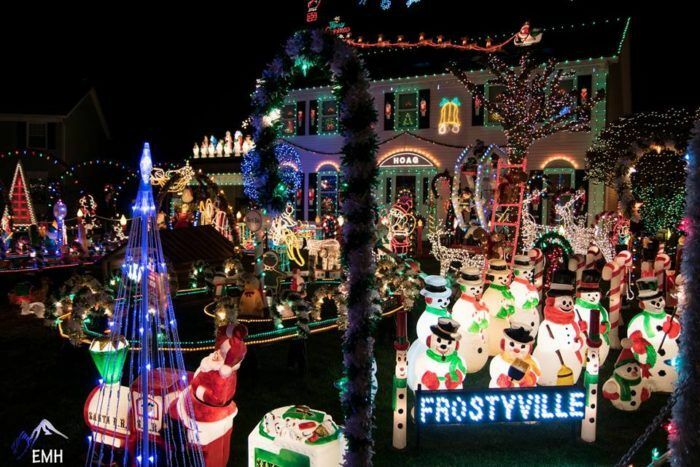 This charming village runs a Christmas Light competition each year so the whole neighbourhood gets involved. Enjoy the myriad of fairy lights and rows of Christmas trees. In the city itself it is hard to go past Martin Place and St Marys cathedral for the traditional Christmas display. And Pitt Street Mall features a spectacular underpass of lights. Why not take a private Christmas Lights tour with one of our friendly guides? It is worth a drive to Old Melbourne Road in Chirnside Park to see an incredible 30 minute light and music spectacular. Pack a rug and picnic chair and grab a bite to eat from the pop up cafe. The 50000 LED lights are sure to impress. In Doncaster East head to 10 Pushkin Court for a great display of figurines and an impressive life size santa and his reindeer. In the city head to Federation Square to see the large Christmas Tree or revel in the atmasphere at Melbourne’s Christmas Night markets. Follow the surburban sprawl south of the city to Lyon Road, Aubin Grove. 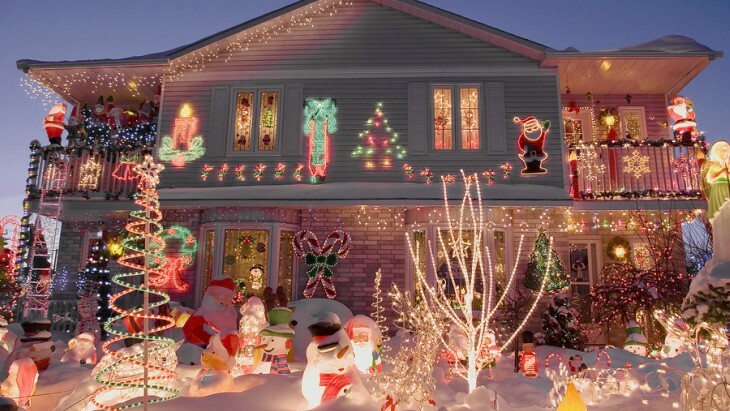 Here you will find a cluster of homes that feature a display that includes an 18 meter christmas tree fully decorated with an accompaning reindeer, snow machine and nut cracker. Enjoy a uniquely Australian tradition of devouring a sausgage sandwich available from a number of local stalls, as you stroll the busy streets. At 14 Calophylla Way in High Wycomb you can even get a glimpse of Elsa from Frozen along with Mickey Mouse. Or for something a little different enjoy a scenic cruise down the Swan River. Cruise past exclusive homes to see their luxury displays. The town of Lobethal is located just 20 miles from the centre of Adelaide in the Adelaide Hills. This small farming community has famed a Chritmas festival each year for the past 60 years. 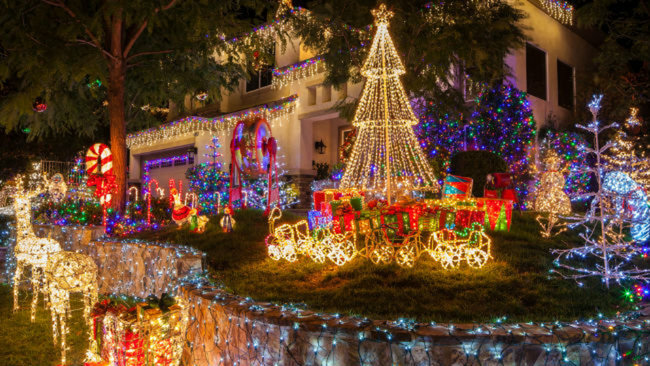 Over 800 homes in a town that has a population of only 1600, each year join to create one of the largest light displays and Christmas festivals in the southern hemisphere. The best way to see this incredible display is to take a bus from the centre of the city. 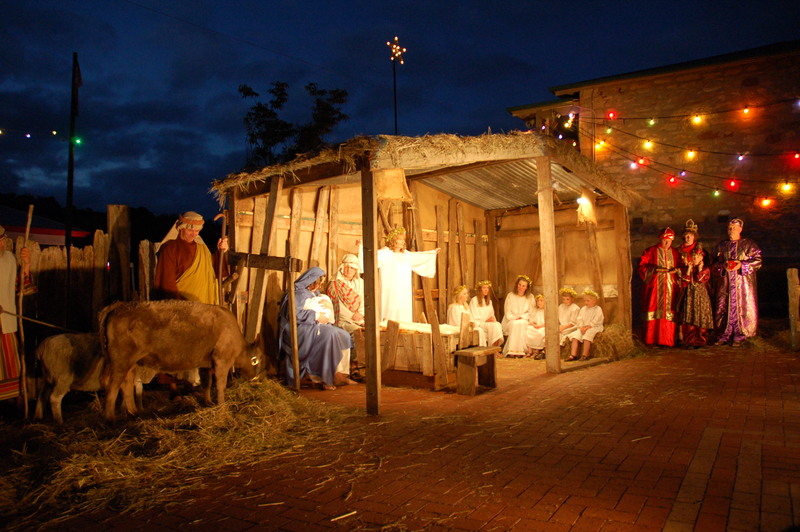 Your tour includes a scenic drive around the town of Lobethal to see all the best displays along with time to stop and immerse yourself in the local atmasphere and truly engage in the spirit of Christmas. PreviousPrevious post:Australian Open 2018: Where to view the matchesNextNext post:WHAT DOES HOBART HAVE TO OFFER?